Kansas City Royals 2018 Schedule has been announced! Get ready fans because it’s going to be an awesome season! 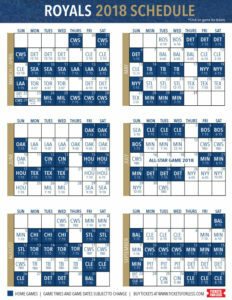 Print the Kansas City Royals 2018 Schedule here. Kauffman Stadium. Kansas City, Mo. Home of the 2015 Wold Champion Kansas City Royals. See our 10 bold predictions for the 2019 Kansas City Royals below. Moustakas Breaks the Record- Most home runs in a single season!